Jako ludzie, instynktownie reagujemy na kolor. Niezliczone ilości obiektów w naturalnym świecie wysyłają nam wiadomości do naszego mózgu poprzez kolor. Czy jest to niebieskie niebo, czerwony wóz strażacki czy żółto czarny trzmiel, kolor wywołuje reakcję psychologiczną. Niektóre treści na tej stronie dostępne są wyłącznie w języku angielskim. Knowing how color is commonly used in design projects is another helpful approach to selecting color. 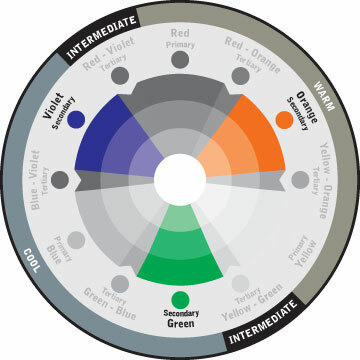 The design professionals constantly monitor the latest research on psychological and physiological responses to color to create effective and stimulating design. As you think about your project, consider the following uses of color. The strongest energy of any color, red is best used in rooms that require interaction, such as dining rooms, where it is thought to stimulate the appetite. Red also adds drama to dens, hallways and powder rooms. A pale red, pink is associated with a delicate, feminine look and is used to soften and lighten the look of bathrooms and bedrooms. Pink may be looked upon as elegant, refined and poised. Often considered the most social color, orange is also the color of creativity and imagination. It works well in family rooms and dining rooms, as well as bathrooms where its peach tones help complement skin complexions. The color of happiness and optimism, yellow suggests positive, cheerful feelings and can be used to brighten practically any room. Yellow is great for “work rooms” such as kitchens and laundry rooms. Associated with health and fertility, green is a cool, relaxing color that also connotes a feeling of renewal and growth. It works well in living rooms, dens and bedrooms and is considered a natural, neutral tone. Tranquil and meditative, blue is perhaps the most peaceful of all colors, exerting a soothing, calming influence. Great for bedrooms and baths, it's often used with an accent color, as too much blue can create a cold, dreary feeling. Traditionally the color of royalty, purple tones evoke a feeling of luxury and nobility. This majestic color works well in bedrooms, living rooms and bathrooms where it can give a sense of lavish opulence. 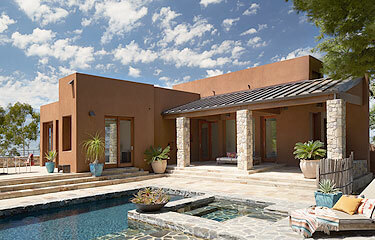 An earth tone, brown is the most natural of all colors and helps “ground” any color scheme. Brown is good for living rooms, dens and hallways. It works best with an accent color that will keep it from becoming too monotonous. White is the most neutral of all colors and gets along well with practically any other shade. Elegant and sophisticated, it can be used to open up spaces and as a backdrop for kitchens, baths and any room that requires a crisp, clean, well-designed look. A dramatic color, black is often used as an accent to embolden other tones.It works well with white to create a classic, timeless motif. You can also use black with jewel tones for a sparkling magical appearance. For certain styles of homes, research the appropriate traditional color schemes for time-tested ideas that work. Pick a color that complements the home's brick, siding, stone or roofing. Choose a color scheme that blends with the neighborhood. If required, check with the homeowners' association for any color restrictions. Because color may appear different depending on the time of day, paint a section of the house where the body, trim and accent colors can be viewed together. Then check the colors throughout the day to see how they look. To highlight architectural details, such as shutters and columns, choose a color that contrasts with the wall color of the house. 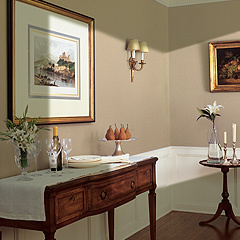 For example, if the wall is a light color, choose a darker color. To minimize attention to unattractive elements such as downspouts, air-conditioning units, vents and gutters, paint them the same color as the wall of the house or choose a trim color that is a similar shade. 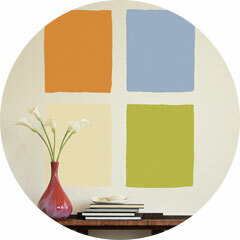 Light colors make a room seem larger, while dark colors are best for accenting recessed areas and highlighting details. Use items in a room to provide color hints. Pick a piece of furniture, art or even a pillow for inspiration. Select your color preference and see what other colors work well with it. Connecting rooms should share color elements. 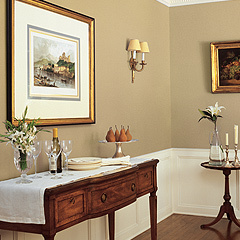 For example, using the same color on molding in adjoining rooms unifies an open space. Use light and dark colors to create interest. Attractive architectural features, such as molding and columns, can be emphasized by painting them darker or lighter colors. Consider the home's flooring. The color of the carpet, tile or hardwood flooring plays an important role in the feel of a room and affects how a color appears. Pay attention to the trim in a room. Painting the trim and walls the same color will remove attention to the trim and make it less noticeable. Using a contrasting color for the trim will give it a focal point, making the room more interesting, and add some dimension to the room. Nothing changes our perception of color more than light. Paint, textures, fixtures and furnishings are all affected by light. That's why it's imperative that you assess colors under the predominant lighting conditions for your projects. There are three primary lighting sources: direct sunlight, indirect sunlight and artificial lighting. Direct sunlight is considered the most ideal light source because it provides the truest interpretation of color and provides the best balance between warm (yellow shades) and cool (blue shades) extremes. Indirect sunlight is inconsistent, varying throughout the day and greatly impacting the color in a room. The intense gold rays of sunrise and long dark shadows of twilight “warm” and “cool” room colors in dramatic fashion. Indirect sunlight is the most volatile and unpredictable lighting to assess. Artificial lighting can be separated into either warm or cool light. Incandescent and halogen lights enhance reds and yellows, warming up a room. Fluorescent and energy-saving bulbs enhance blues and greens,cooling or flattening a room's color. Artificial light will change colors simply by the type of bulb that is used. Red, blue and yellow are the three primary colors that cannot be made by mixing any other colors. These three colors can be mixed to create all other colors and can be combined with white or black to create tints (lighter tones) and shades (darker tones) of these colors. Secondary colors are created by mixing two primary colors together. For example, mixing blue and red make purple, red and yellow make orange, and yellow and blue make green. The exact color of the secondary color you get depends on which red, blue or yellow you use and the proportions in which you mix them. If you mix three primary colors together, you get a tertiary color, which can also be made by mixing primary and secondary colors. Varying the proportions of these colors creates different tertiary colors. Clean and elegant, a monochromatic scheme feels sophisticated and stately. The scheme revolves around colors from the same family with varying intensity and value. Lighter tints and darker shades, as well as muted forms, are used. Monochromatic colors are easy to manage and always look balanced and visually appealing. However, they lack color contrast and are not as vibrant as other schemes. Opposition creates interest, which is the idea with a complementary color scheme. Using colors that are opposite each other on the color wheel creates visual excitement. When these warm and cool colors mix, they energize each other, bringing any décor to life. Complementary colors offer stronger contrast than any other color scheme and draw a lot of attention. They can, however, be harder to balance than other schemes, especially when working with desaturated or warm colors. 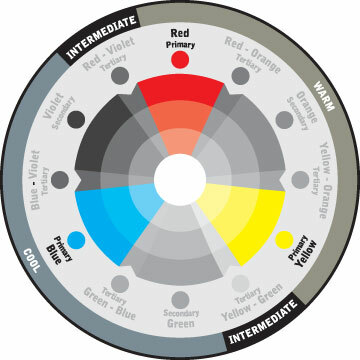 When painting the interior or exterior of your home, a good first step is to gain an understanding of a color's visual temperature. The temperature of a color - whether "warm" or "cool" - must be considered both individually and when used with other colors. Reds, oranges and yellows are considered warm colors, while blues, greens and violets are perceived as cool colors. The visual temperature of a color can accentuate or change the look and feel of your project. For example, cool colors make a small area feel spacious and calm. 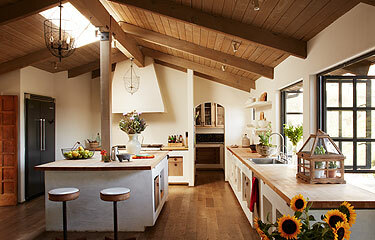 On the flip side, large areas feel cozier and more intimate in warm colors. Now you can test almost any Perfect Palette ® color before making a major purchase with a Dunn-Edwards 8-oz. Perfect Palette ® Sampler. Just select the color that piques your interest, and we'll mix it on the spot so you can see exactly how it will look before you paint. It's the quick and easy way to cut those big decisions down to size. To see how natural and artificial light affect your color, paint the same color on different walls. Paint the wall that gets the most light and the wall that gets the least amount of light. It's best to paint at least a 2-foot-by-2-foot sample area on a white background. To get the best results, apply at least two coats and let the paint dry for a couple of hours. Now live with the color for a few days. See how the colors feel in the morning and evening. Which color best expresses your vision? Once you've made your decision, you're ready to start painting.